In addition to these new features, we now have an official Russian translation as well. We hope you enjoy the update - give it a try! You can download the app in all countries from Android Market. The Google Reader app is available for devices running Android 1.6 or higher, with widget functionality available for devices on Android 2.2+. Is it finally possible to move it to SD card? Its HUGE we don't all have 50 gigabyte memory on the phone you know. What about Google apps support? It should be your #1 priority! Second the request on SD card -- but what would really be nice would to be able to increase the screen font. Not all of your users are are in their teens and twenties! For those requesting an SD card install ... widgets do not work with applications installed on the SD card. If the application is installed on the SD card, you loose the ability to install the widgets (they vanish from the list). widgets are for 2.2+ only? Awesome. Now can we improve the Facebook app? I'd like to see a full screen widget that is scrollable otherwise I love the update and keep up the great work! Please can we have an iPhone version? This app looks so useful. Equally important, the app should allow you to use the SD card for data and cache storage, or allow you to set limits. When I tried Google Reader, it took up more than 10MB on my internal store for its data and cache. This is unacceptable on a Nexus One with very little internal space for apps. I love it from the very begining. All the other apps i try befor that connect to Google Reader were missing a lot of features or the Sync just didnt work. nice, but how about offline support. I have a crappy, expensive, slow, unreliable 3g connection, but fast wifi at home. I'd like to load up before work then read during the day. When's this going to be possible? @Poldie - just get NewsRob instead if you want top notch offline support and syncing (the developer is very responsive to suggestions too, which is great!). +1 for moving to SD over widgets. My nexus one runs right at the storage limit. Has anyone had any trouble syncing Google Apps accounts with Google Reader? Anything that's non-Gmail that's synced to my phone doesn't seem to work. I made sure that "Google Reader" is checked under Sync options for the specific account, and that the account permissions are accepted when prompted by the app. However, when the app loads up, it says I have no subscriptions. What is still missing is the ability to email a complete news article, not just a link to the article. "Mark previous as read" is great. Thanks. App to SD far more important than widgets. N1 too limited in app storage space. Please add ASAP. Thanks in advance. Does this app still over ride the default functionality of the volume buttons. I think this if it is still in is very bad practice. As bad as overriding the back button. Try it play some music while using the app. Why do you need to access my contacts now ? Love the widget - has replaced my regular news ticker. On a very minor note - any chance we could choose colour? The black would match gingerbread better. I want 2.1 support for those widgets! We still can't adjust font size... One of the most requested feature. it is very good and fast. 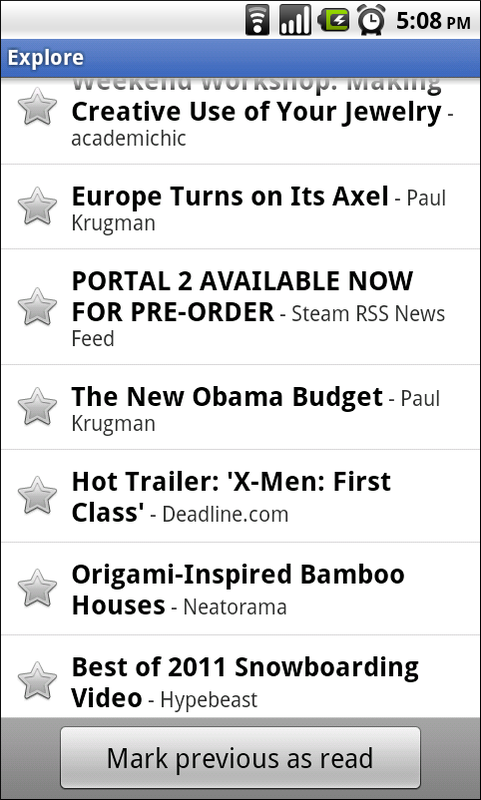 i would like to have a preference to render all sites (not only the native blogs) in mobile view. just as it looks when the reader opens in the browser. that's what I miss at all readers. I like to keep my internal storage at 40mb or more to keep it quickly responsive. As a result, most programs that are nice to have, especially those running in the background or requiring a widget. I've deleted. I still have well over a hundred incredibly useful programs installed, including several action games close to a 100mb in size. My phone is the first gen Motorola DROID with the FROYU upgrade. awesome update app2sd would be cool. Also when you choose to minimize the top "home" section, why does "people you follow" and "explore" still show ? Is there any way to turn off or hide the "Mark previous as read" button? It takes up too much room on smaller screens, and I prefer to use "Mark all as read". As others have mentioned: Why can't ANY of the Google apps be moved to the SD card?! Oh please give a dark theme. It is much needed for night reading and also saves battery. If possible also consider giving the option of navigation through volume keys. This will save space on the display. For some reason, google reader is consuming 50% of my battery! What a shame.. :/ It happened yesterday, it repeated today. I had to uninstall. 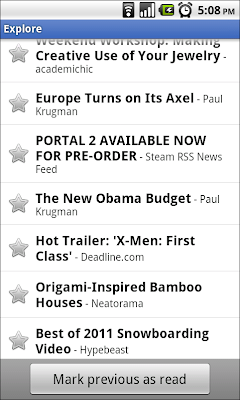 When will support for Android Google Reader, Google APPS?